Provide a vintage look to your décor and add a sense of warmth and coziness by placing this gorgeous handmade carpet in your home. 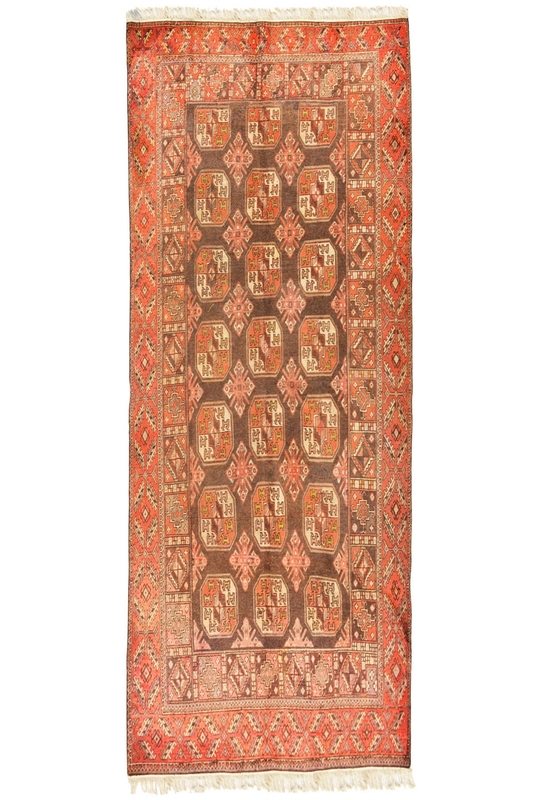 It is a hand-knotted area rug and contains Bokhara design pattern. This design has been originated in 16th century. Shop this vintage area rug from Rugs and Beyond at the best price. This is made in pure wool and cotton material. It is woven in hand-knotted technique which is very old and traditional one to weave area rugs. This is a runner and you can place it in a corridor or in an entryway. The ground of this rug is in brown color and design is in orange color. It contains a Bokhara design pattern which has been originated from Afghanistan in 16th century.